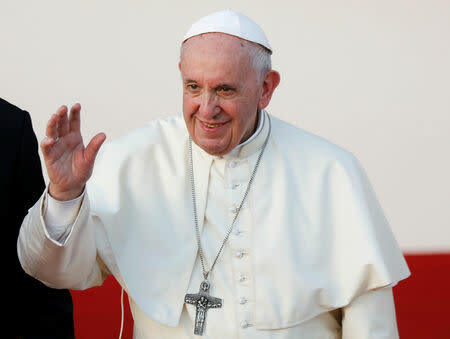 VATICAN CITY/ABU DHABI (Reuters) - Pope Francis is hoping to persuade a country enmeshed in a regional war that he has condemned to give Catholics more freedom when he becomes the first pontiff to set foot on the Arabian Peninsula. Although short, the visit to the peninsula, home to two million expatriate Catholics as well as the holiest sites of Islam in Saudi Arabia, is a landmark one. The freedom to practice Christianity — or any religion other than Islam — varies across Gulf countries. Priests, worshippers and diplomats in the UAE, where there are nearly 1 million Catholics, say it is among the most tolerant countries in the Gulf region toward other religions. Rights groups have accused UAE-backed forces of torturing detainees in areas under their control in Yemen, charges the UAE has denied. The UAE says it has never run prisons or secret detention centers in Yemen and that prisons there are under the authority of the Yemeni government. Its Yemeni allies have denied allegations of torturing prisoners. Hinder, and Vatican spokesman Alessandro Gisotti, said they did not know if the pope would mention it in public, or in private meetings with UAE leaders. "The pope has spoken out about the suffering of the people of Yemen while many others have remained silent," Gisotti told reporters on Friday, without saying to whom he was referring. "He has underscored the need for a commitment for peace and the respect for human rights, particularly of the civilian population and children." The pope will meet privately with Sheikh Mohammed bin Zayed al-Nahyan, Crown Prince of Abu Dhabi, who invited him. Vatican officials call Catholic communities such as those in the UAE "passport Churches" because the priests, like the mostly Philippine and Indian Catholics they minister to, are foreign and need permission to live and work there.